Welome back! Now that I'm no longer part of Onside Analysis I'm free to start blogging again so let's start off by taking a look at how my football Pythagorean is doing for the English Premier League so far this season. In case you haven’t seen it before, my football pythagorean is an adaptation of the baseball Pythagorean that allows you to quickly estimate how many points a team would be expected to achieve on average based on the number of goals they have scored and conceded. It’s a pretty simple little equation but it is surprisingly accurate! Figure One below shows the difference between the actual points each Premier League team has achieved this season and how much my Pythagorean predicts they should have on average. For teams in green the difference is positive so they actually have more points than expected while those in read have gained less points than would be expected based on the number of goals they have scored and conceded. Interestingly, Manchester City are pretty close to their expected points total despite their enormous goal difference. One reason for this is that my football Pythagorean is not linear so as you score more goals they become less valuable to help account for high scoring matches, such as most of City’s home games this season! 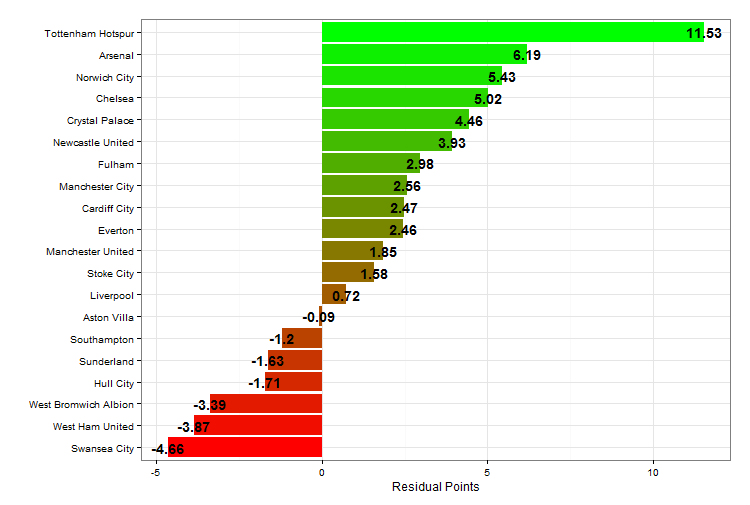 This helps prevent over-prediction of expected points for teams scoring heavily – having a good goal difference is obviously helpful but whether you win by one goal or five goals you still only get three points from the match. As it stands though Manchester City are in second place behind Arsenal who have acquired six points more than expected, meaning that typically we would not expect Arsenal to be top based on their results so far this season. How Will The Season End? As well as looking at how teams are doing so far, we can also extrapolate the results and predict how the teams will end up at the end of the season (Table One). This is a very simplistic prediction, for example it does not take into account strength of schedules, but it is fairly accurate – the r squared value for Pythagorean predicted points versus actual points across multiple leagues worldwide was 0.938 with an average error of less than four points – so it should give a reasonable estimate of how the Premier League will finish next May. Yes you are correct the r2 value I quoted was for the end of the season. Perhaps I should have made that clearer in my last post? It’s good to see that you found the same results as me and that the predicted points stabilises pretty fast in Danish football too.